Is urban ecology an oxymoron? Not at all. The sooner we recognize that cities, people, and nature are inextricably linked, the better off we will all be. In order to broaden our focus from fixing what’s broken, we can treat this city as a design problem, as a system of interrelated parts, and begin to look for connections. Just by looking, we will surely find them. 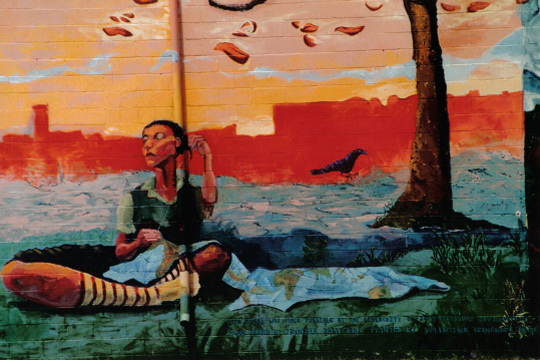 As part of the 2008 Urbanite Project, I saw firsthand the critical connections between urban fishing, water quality, and public health. (“Fishing for Solutions,” March 2008 Urbanite.) Our proposal is to convene a diverse commission that would tackle the complex problem of Baltimore’s storm-water and waste-water with an ecological mindset. The urban ecosystem is a system of networks and relationships, using nature as a mentor for how to foster healthy connections and environments. We can together consider both natural systems and human systems, for the benefit of both. Natural systems include sunlight, rainwater, clean air, wind, gardens, trees, and wildlife. Human systems include housing, stores, schools, jobs, history, arts and culture, and infrastructure. Another benefit of connective thinking is economic opportunity. The waste-water treatment greenhouse at Kolding, Denmark is also a fish farm and a plant nursery, providing income to the operator. The dramatic glass pyramid is only the most visible aspect of an eco-renovation that includes energy efficiency, rainwater collection for toilet flushing, and affordable housing. The water-efficient design saves money from the local water utility to help pay the gardener’s salary. And the residents benefit from a beautiful and clean environment. The places that we design can increase the health, happiness, and prosperity of people, as well as the capacity of the earth to support life. We just have to open our minds and start seeing the connections.